PROPERTY developer LBS Bina Group Bhd said house prices will continue to escalate due to rising land and building material costs. Managing director Datuk Lim Hock San said although 2012 will be a challenging year globally, the company believes that the demand for property in Malaysia will remain strong as prices continue to increase. "Housing prices will continue to go up and it's not because we property developers are greedy. Land cost has gone up. So has labour wages, building material and fuel costs. In fact, financing cost has also gone up," he said. Following the inflationary effects on the housing market, Lim is hopeful of his marketing team achieving RM800 million in sales this year. This would be 20 per cent more than last year's RM663 million. LBS Bina plans to launch 16 projects with gross development value totalling RM1.5 billion. There will also be 21 ongoing projects worth another RM665 million. "Currently, we have some 920ha landbank with an estimated gross development value of RM9.1 billion," he told reporters after the company's shareholders' meeting here yesterday. The housing projects are spread across D'Island Residence in Puchong, Bandar Saujana Putra in Putrajaya, Taman Golden Hills in Cameron Highlands and Bandar Putera Indah in Batu Pahat. Lim said houses priced over RM233,000 at Bandar Saujana Putra should generate about 36 per cent of its sales target. "The D'Island Residence, which offers resort-style homes valued at RM1 million and above, is expected to contribute 30 per cent, while non-residential developments an estimated 14 per cent in sales," he said. At the shareholders' meeting, the company announced a share buy-back of up to 10 per cent of its own issued and paid-up share capital. PETALING JAYA: LBS Bina Group Bhd is eyeing RM800mil and RM950mil in sales of its properties for this and next year respectively, after raking in RM664mil last year and RM422mil in 2010, according to managing director Datuk Lim Hock San. Its unbilled sales was RM649mil as at Dec 31, 2011, which could be realised when construction was completed, Lim told a media briefing. Lim cited a tougher external environment, competition and more stringent lending regulations issued by Bank Negara as challenges, but said he believed the company's portfolio of medium to high-end residential properties would be key to achieving its sales target this year. “As far as I'm concerned, the Malaysian property market will be alright,” he said, adding that demand for property would remain strong although prices would increase at a lower rate. Starting Jan 1, banks are required to use net income to calculate the debt-service ratio for loan approvals across all consumer loan products including housing and personal loans. This year, LBS will launch 16 projects valued at RM1.5bil. The company has a land bank of some 2,300 acres worth RM9.1bil in gross development value and ongoing projects worth RM665mil. On the progress of LBS' development in Zhuhai, southern China, Lim said it would not get off the ground this year due to high inflation and property prices, which were likely to push back construction on its 197-acre plot to next year. Of its targeted sales for residential properties, 36% is expected to come from its medium-range Bandar Saujana Putra homes, 34% from its medium-to-high-end homes, and 30% from its high-end development D'Island Residence. An analyst told StarBiz that LBS' targets were realistic based on its pipeline, and that sales would be anchored by the resort-style D'Island Residence in Puchong. He said landed properties could still see resilient take-up rates, even though prices might decline in view of the weaker economic sentiment. Meanwhile, shareholders have approved a share buy-back of up to 10% of the company's issued and paid-up share capital at its EGM yesterday. For the quarter to Sept 30, 2011, LBS' revenue was up 56.8% to RM125mil from a year ago while net profit surged 95.8% to RM8mil backed by sales of its properties in D'Island Residence, Bandar Saujana Putra along with commercial and industrial projects. 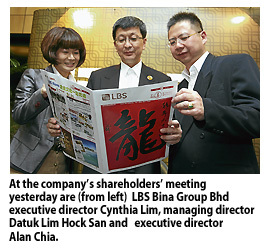 LBS shares ended one sen higher at 78.5 sen yesterday, with 593,600 shares traded. PETALING JAYA: Seacera Group Bhd will this year kick-start a 500-acre mixed development project in Ulu Langat, Selangor with a gross development value of at least RM2bil that will span over 10 to 15 years, its managing director Zulkarnin Ariffin said. "We'll probably start on 50 acres first," he told StarBiz via the phone yesterday. Of the 500 acres, Seacera owns 113 acres, which it bought from land owner Duta Skyline Sdn Bhd for about RM27mil or RM5.50 per sq foot. The remaining land is currently owned on a 78:22 joint-venture basis with Duta Skyline, with the larger portion by Seacera. Zulkarnin said Seacera had the right of first refusal (which basically means the right to buy something before the offer is made to other parties) to buy the remaining land it currently co-owns with Duta Skyline but no decision on this had been made yet. As at Sept 30 last year, Seacera had RM6.6mil in cash and cash equivalents. Zulkarnin said the company, which is essentially a tile maker moving into the property segment, would realise this year a gain of RM30mil from the disposal of a factory building in Selayang. He said although Seacera had signed the agreement with Duta Skyline a few years ago, the delay in kick-starting the development was due to some issues faced by Duta Skyline in relation to its earlier loans it took to buy the said land. "The issues are near to being resolved," he said. Meanwhile, recent filings to Bursa Malaysia show that Zulkarnin had from the period of Dec 20 to Dec 22 bought a total of 1.8 million shares at 54 sen a piece bringing his stake to 19% in Seacera. "I see value in the company," he said. Last Friday, some 4 million shares were also crossed to unidentified buyers, suggesting that there could be some new major shareholders coming into the company. It is learnt that corporate personality Datuk Samsudin Abu Hassan who was one of the major shareholders of the company has exited the company completely. Shares in Seacera have put on 26% over the past two trading days ending at 65.5 sen at yesterday's close. For the third quarter ended Sept 30, 2011, the company made a net profit of RM981,000 on sales of RM24mil. SINGAPORE: The rental market could brighten for landlords this year as home-buyers defer buying units in the wake of the recent cooling measures, said analysts. They believe the larger pool of tenants might stabilise the rental market or even drive a pick-up of up to 5% in rents over the next 12 months. These analysts' comments are a contrast to earlier expectations that rents were set to fall as a large supply of completed units come onto the market this year. Analysts had predicted a possible softening of rents this year due to the new private and public homes that will be completed within the next few months. But some consultants now say that foreigners considering buying might be persuaded to head to the leasing market, after being put off by the recent introduction of the additional buyers' stamp duty of 10%. “(The measures) effectively increase their (financial) risks tremendously if they buy and ... get reassigned elsewhere or lose their jobs (within the first two years),” said Alan Cheong, head of research at Savills Singapore. “Leasing has always been seen as a faster and easier decision to make as compared to buying a property because of the lower commitment level and the smaller amount of money required upfront,” said OrangeTee managing director Steven Tan. In the third quarter of last year, the Urban Redevelopment Authority (URA) rental index of non-landed homes showed increases compared with that of the previous quarter, although the index rose at a slower pace in the central regions and suburban areas. While demand from foreigners and expatriates is expected to be the main driver of the residential leasing market next year, the local factor cannot be ignored. There may be some locals who have sold and want to rent, and wait until they can buy at a cheaper price. There may also be locals who are now unwilling to sell their home given the weaker market. Cheong suggested that the expected dip in rents was now unlikely, with the effects of the measures partially balancing it out. URA figures indicate that 9,584 apartments were completed between the third quarters of 2010 and 2011, with rents rising 6% during that period. “This suggests that rental demand was substantially greater than supply. Thus, barring external shocks or policy changes that affect immigration, rentals should at least be stable in 2012,” he said, noting that the rate of immigration was still strong and might remain so for years to come. Market watchers added that global economic uncertainty would also have an impact on rents. Hardest hit would be the high-end sector, said Cheong, with rents possibly experiencing declines of up to 5%. New arrivals of foreign white-collar workers might have more constrained rental budgets, said other consultants. “Rental budget cuts will lead tenants to look at cheaper alternatives so projects in mid-prime or well-located city fringe or suburban locations may be in greater demand,” said Ong Teck Hui, head of research and consultancy at Credo Real Estate. 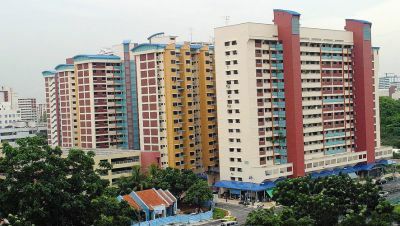 Price rises of resale HDB flats have moderated in the final quarter of 2011. SINGAPORE: The rate of increase in private residential property prices continued to moderate for the 9th consecutive quarter, according to flash estimates by the Urban Redevelopment Authority. The private residential property index rose from 205.7 points in the third quarter of 2011 to 206.2 points in the fourth quarter of 2011. This represents an increase of 0.2%, compared to the 1.3% increase in the previous quarter. Prices of non-landed private residential properties increased by 0.5% in Core Central Region and by 0.6% in Outside Central Region in the quarter. There was no change in the prices in property prices in the Rest of Central Region. In comparison, in the third quarter of 2011, prices of non-landed private residential properties increased by 0.7% in the Core Central Region, 1.2% in Rest of Central Region and 2.1% in Outside Central Region. Meanwhile, price rises of resale Housing and Development Board (HDB) flats have moderated in the final quarter of last year, rising 1.7% compared to the 3.8% rise seen in the third quarter. This comes after two quarters of accelerated prices rises since the second quarter of last year when prices rose 3.1%, compared to 1.6% seen in the first quarter. Analysts have expected the market to cool somewhat in light of the global economic uncertainty and moves by the government to cool Singapore's property market by imposing heavy stamp duties on residential transactions. The HDB's estimate released yesterday brings the HDB Resale Price Index (RPI) to 190.4; the RPI provides information on the general price movements in the public residential market. HDB said yesterday it had offered 28,043 flats for sale last year to address hot demand for homes. This comprised 25,196 new flats under its build-to-order system and 2,847 balance flats under the sale of balance flats exercise. 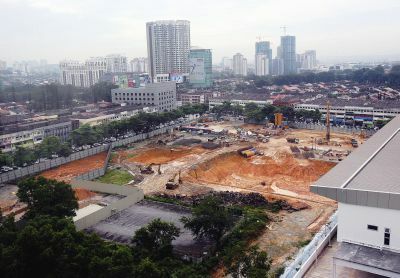 The second phase of the Uptown commercial project in Damansara Utama, Petaling Jaya, will begin this year and several measures have been put in place for construction work to begin. The development consists of a residential block, an office tower, a shopping mall, service apartments and a 1.62ha eco-park. Several open air car parks in the area have already been closed to facilitate piling and earthwork for the residential block in Jalan SS21/60. 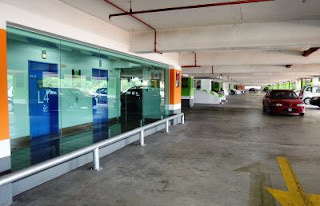 See Hoy Chan Sdn Bhd executive vice-president Joe Tan said the Uptown 7 multi-storey car park had been upgraded recently to accommodate more vehicles due to the closure of the open air car park. All ready: Earthwork has already started for the Uptown Phase 2 development and the developer has taken various measures to ensure that parking is sufficient and traffic manageable. “It used to be only 30% occupied but now it has risen to 80%. We built a new ramp for better accessibility,” said Tan. The interior of the structure has also been given a facelift with brighter colours, more lights, CCTV cameras and security guards. There are also more signages put up, making it easier for motorists to park. Tan said the parking rates had also been reduced to RM1 for the first three hours, compared with RM1 for the first two hours previously. 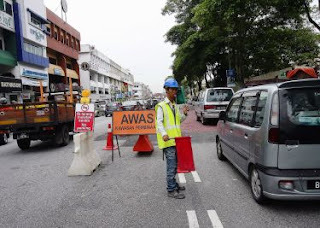 Helping out: Guards are stationed at the corner of Jalan SS21/37 and SS21/60 near the entrance of the construction site to manage traffic and ensure that the public do not double-park in the area. The rates are lower than the Petaling Jaya City Council (MBPJ) parking rates of 60sen per hour at the public parking bays. “We want to encourage the public to use the multi-level parking. We have had several rounds of discussions with the business owners and residents to keep them updated on our development plans,” he said. Now, many of the parking bays are taken up by shopowners and Tan advised them to park at Uptown 7 to free the public parking spaces for their customers. “We are providing a free shuttle service to pick up and drops off people at various stops in the commercial area. We started with one van and the response was good so we added another for the service. New look: The Uptown 7 multilevel car park has been given a facelift to make it brighter and more comfortable, like this glass panel at the lift lobby on each floor. “If the response continues to be good, we will look into making it a long-term service,” Tan said. The shuttle service starts from the Uptown 7 parking area with a frequency of every 20 minutes and stops at Uptown 5, Uptown 1, Uptown 2, HSBC, Malaya Optical, Perodua, Station 1 Kopitiam and Public Bank. “We have stationed a security guard at the shuttle service waiting area to make it safer for commuters,” he said. Tan said they had also more security guards patrolling day and night. There are also guards stationed at the corner of Jalan SS21/37 and Jalan SS21/60, where construction vehicles enter and exit the site to manage traffic flow and prevent people from double-parking. The initial stages of construction would see a tunnel being built in Jalan SS21/37, near Uptown 37. The tunnel will provide direct access to the basement of the retail mall from the Damansara-Puchong Highway. “The tunnel will also be used by our heavy vehicles so they do not have to use the service roads in the commercial area,” said Tan. He said the mall in Uptown was not meant to compete with the big shopping centres but to cater for the surrounding community and those working in the area. The service apartments will sit on top of the retail mall and run by a Singaporean company. The residential block is expected to be completed in the third quarter of 2014 while construction of the office tower and mall will start next year. The whole project is expected to be completed in 2016.